FORT BRAGG, N.C. -- When retired paratrooper Ronnie Bland asks, "What's not to like about playing video games all day?" he is only being half facetious. 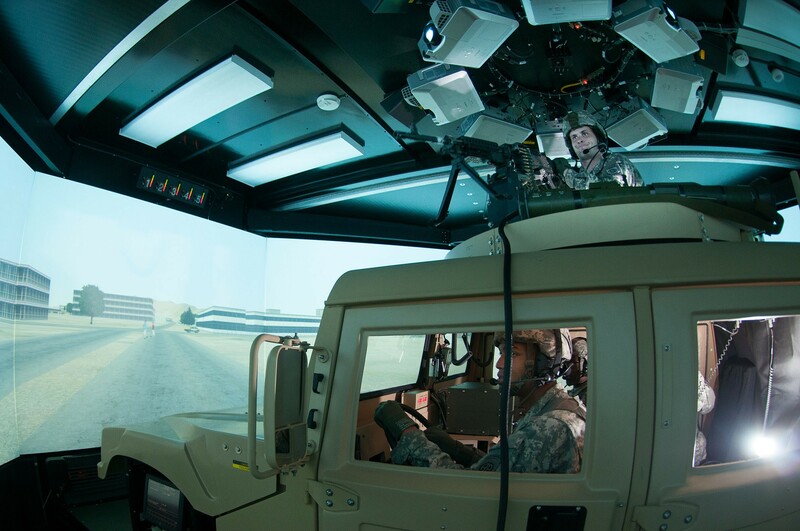 As the senior enabler on a life-sized, virtual convoy-skills trainer called the Special Operations Reconfigurable Vehicle Tactical Trainer, Bland likes knowing that the skills young soldiers pick up in the simulator may someday save a life or help to complete a mission. "I wish we had something like this when I was in," said the former signal soldier, who deployed for Desert Shield/Desert Storm and twice for Operation Iraqi Freedom. 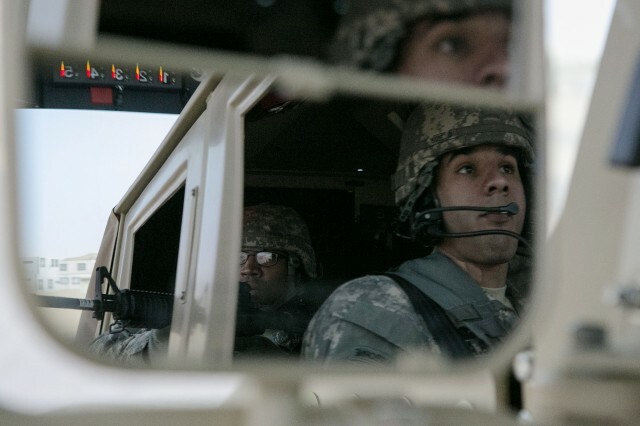 Housed in a half-dozen trailers on the edge of Fort Bragg's weapons ranges, the convoy simulator incorporates four life-sized Humvees, each surrounded by screens with synchronized projected video of a mission scenario. 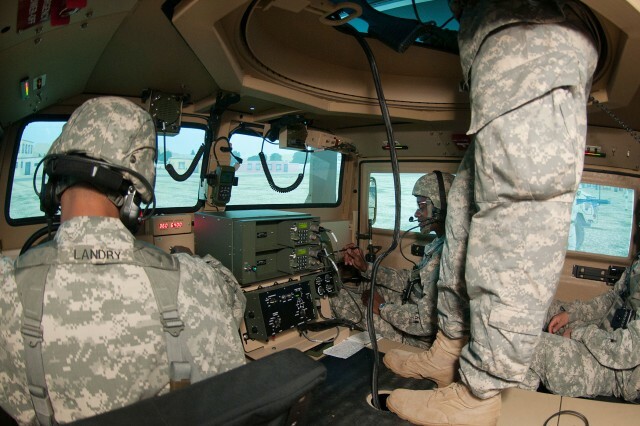 Each Humvee is outfitted with a field radio, GPS-based "Blue Force Tracker," and weapon options that include an assortment of machine guns, grenade launchers, rifles and anti-tank devices. 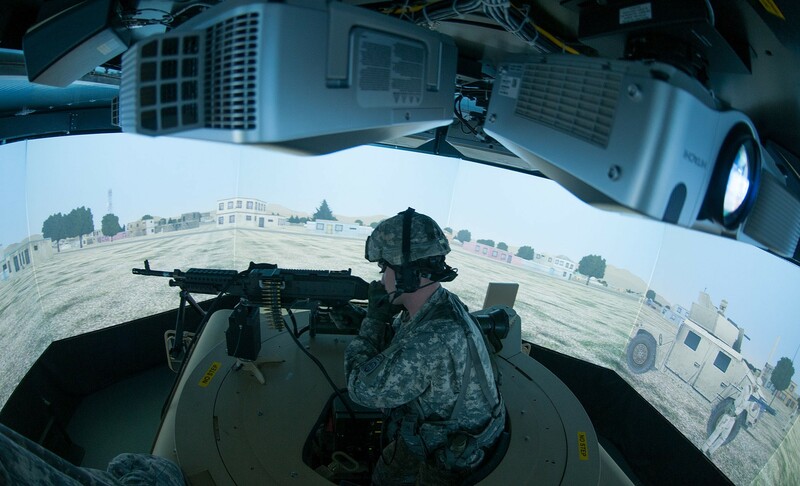 "We see the Tactical Trainer as a way for our soldiers to learn the fundamentals of battle drills without having to dispatch vehicles and draw weapons," said Capt. Robyn Boehringer, commander of a company that provides forward support to paratroopers with the 82nd Airborne Division's 2nd Battalion, 504th Parachute Infantry Regiment, part of the 1st Brigade Combat Team. When soldiers join the Army as part of the quartermaster corps, they're not really thinking about being on the road in combat zones and employing infantry-like tactics nearly every day, but as part of a forward support company, that's often what a deployment is like, said Boehringer. "With my [noncommissioned officers], I'm giving them baseline infantry tactics that will hopefully save their lives," she said. The virtual training was a prelude to live-fire training her company is scheduled to participate in within a month or two, she said. 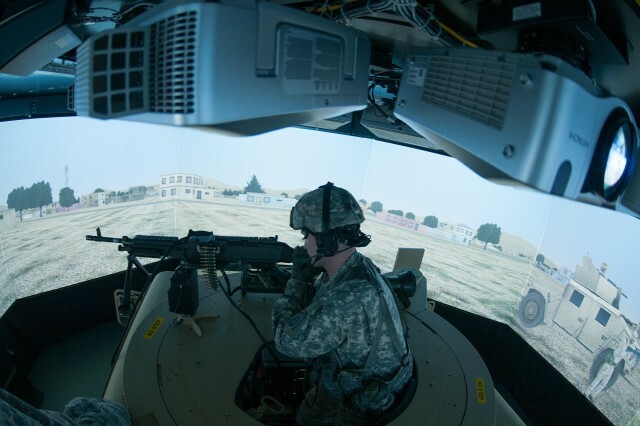 Inside the trainer, the life-sized graphics, realistic sounds and pneumatically induced weapon recoil can be tailored to a unit's requests, said Bland. 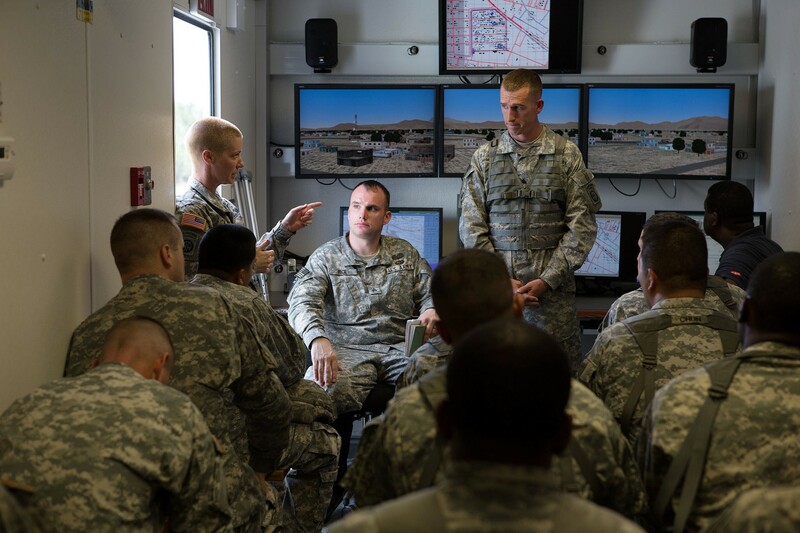 One room houses an array of monitors that acts as a tactical operations center during missions and as a debriefing room for after-action reviews during which missions can be replayed from a variety of viewpoints on several monitors simultaneously, he said. 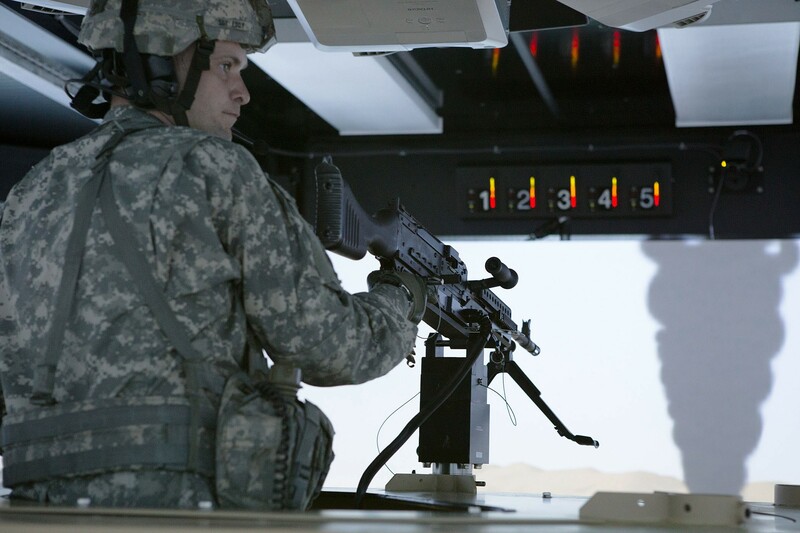 Soldiers can practice maintaining vehicle-spacing intervals, using the radios, plotting routes and sending messages on the Blue Force Tracker, and reacting to enemy contact from roadside bombs, small-arms fire, tanks, aircraft and minefields. "With this system, the soldiers have more time for training and less for administrative," said Bland. "He's not thinking, 'I've got to clean my weapon. I've got to clean the vehicle. When are we going to get done?'" The trainer is ideal for new soldiers who have never deployed, said Sgt. 1st Class Robert Anderson, one of Boehringer's platoon sergeants. 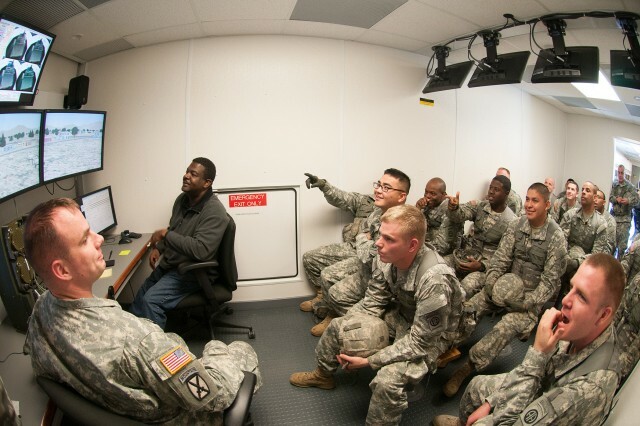 With three deployments and nearly 20 years of service under his belt, Anderson was impressed with how collective skills were learned by his soldiers inside the Tactical Trainer. "It gives them confidence that the man to my left and right, front and rear, knows what he is doing," said Anderson. "They know what each other will do in a given situation." 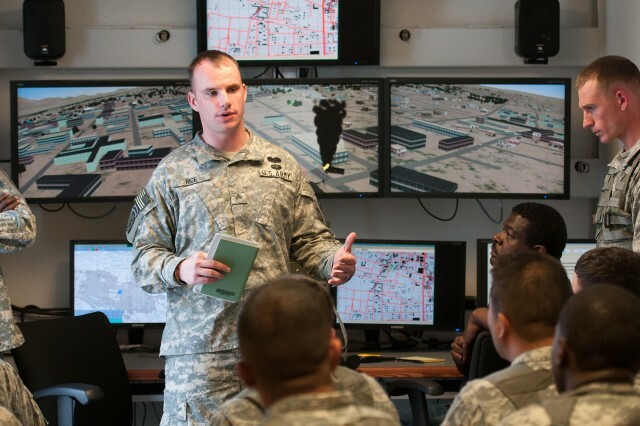 Anderson was complementary toward Bland and his associates who operate the facility, particularly on how they tailored the virtual experience for his platoon's needs. "I tell my soldiers that in combat they're never going to see all the things these guys throw at them all at once, but they might. It's challenging. I have to remind them, they're not failing. They're learning," said Anderson. Bland said the facility is easy to book, and even a squad leader can call him to arrange for an afternoon or several days of training. All of the training is unit-led. Bland and his staff act solely as enablers, he said.